Mild-mannered veteran Leon “Foggy” Poole (Wendell Corey) is working as a bank teller in L.A. when a gang of robbers take it off. He’s bashed over the head during the hold-up, and shortly after Detective Sam Wagner (the mighty Joseph Cotten) learns that Poole was the inside man. When the police arrive at his apartment, they go in guns blazing (some things never change). Wagner winds up unintentionally blowing innocent Mrs. Poole away and Poole is sent to a minimum security prison for 10 years. Before he’s sent off, Poole vows revenge against Wagner. Behind his big glasses, the look in his eyes lets you know he means it. Someone’s going to die for his wife’s murder…maybe even Mrs. Wagner. An eye for an eye as they say. Two years of good behavior lands Poole at a prison farm, where he almost immediately escapes, killing a guard and leaving the corpse in a wet ditch. It’s a brutal scene for its time and Boetticher shoots it with stark efficiency. He also shoots the opening bank robbery scene with an alarming amount of straightforwardness, heightening the tension through blasé photography. It’s effective and chilling camerawork of some tightly wound set pieces. The Killer Is Loose may be a cheapie from United Artists (a B-movie factory at the time), but it’s seriously elevated thanks to Boetticher’s direction and Corey’s disturbing performance. It’s punchy approach to a dragnet procedural is way edgier than many docudramas of the time. DP Lucien Ballard uses some oblique angles to set the audience on edge, but for the most part it’s devoid of the expressionism found in classic noir. 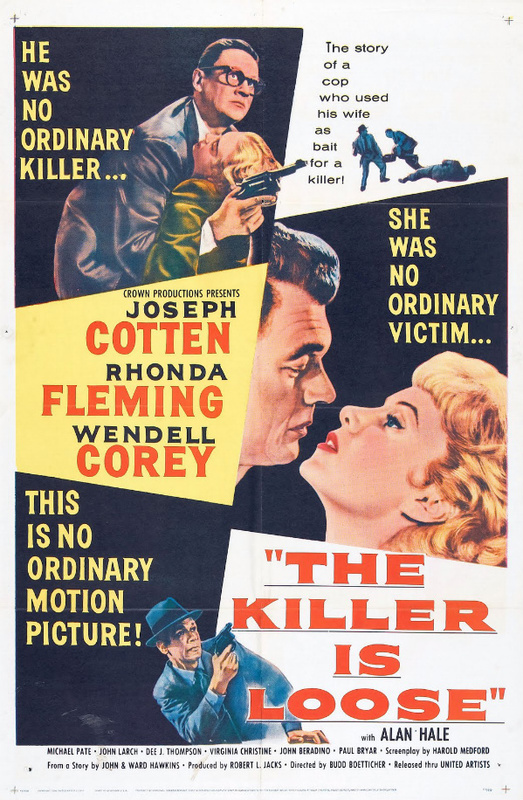 Aside from exploring the psychological wounds of war left on Poole, The Killer is Loose also looks at the impact Wagner’s job has had on his marriage to Lila Wagner (Rhonda Fleming). This romantic angle is pretty damn weak and would become well-worn territory in years to come (only to be replaced by the divorced, alcoholic detective later on). Wagner tries to shield Lila from the ugly and violent world of cops and robbers, but with Poole’s escape, she’s hurled right into the thick of it. It’s lousy how Wagner lies to her so much. His intentions are in the right place, but his designs wind up making it worse during the film’s taught climax. While the climax is a superbly constructed work of suspense, the most chilling scene of The Killer Is Loose finds Poole inside the house of a fellow veteran he served with, Otto Flanders (John Larch). Poole terrorizes the man’s wife (the threat of sexual assault feels very, very real here) until Flanders comes home. With a pistol leveled at Flanders, Poole glares around the suburban kitchen, dreamily confused, until Flanders taunts him to his breaking point in a botched attempt to protect his wife. This is one of my new favorite suspense scenes in noir where a lunatic has the good guys by the balls. It’s up there with the target practice scene in Road House. My only real problem with The Killer Is Loose is Joseph Cotten’s uncharacteristically flaccid performance. The only time he shows some authentic fervor is during the climax, when his wife is in walking to the gallows. While he phones it in, Corey brings the heat with a genuinely disturbing performance that says a lot about post-war disillusionment and the horrors that followed a lot of men home. The Killer Is Loose is getting loose on Netflix streaming at the moment. It’s above and beyond most 1950s cheapies.